Step out of the city life by going to Mary Cairncross Scenic Reserve and Noosa Main Beach. 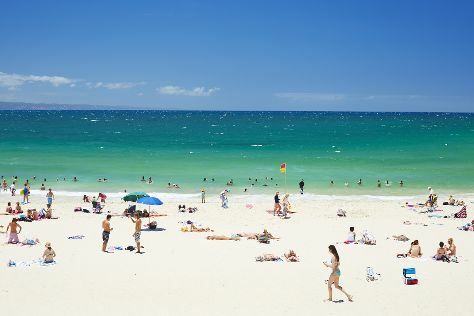 You'll get in some beach time at Mooloolaba Beach and Bulcock Beach. Change things up with these side-trips from Noosa: Buderim (Atrium Gallery at Buderim Craft Cottage & Buderim Forest Park), Mooloolaba (Dolphin & Whale Watching, Scuba & Snorkeling, & more) and Maroochydore Beach (in Maroochydore). Spend the 16th (Sat) exploring nature at Kondalilla National Park. Spend the 20th (Wed) exploring nature at Glass House Mountains National Park. And it doesn't end there: explore the striking landscape of Noosa National Park, enjoy the sand and surf at Peregian Beach, tour the pleasant surroundings at Kings Beach, and explore the striking landscape at Mount Coolum. To see maps, reviews, other places to visit, and other tourist information, go to the Noosa trip planning tool . If you are flying in from France, the closest major airports are Brisbane International Airport and Gold Coast Airport. Finish up your sightseeing early on the 22nd (Fri) so you can travel back home.